The Partnership has recently completed a number of interesting conservation projects on paint schemes of varying dates: from the multiple medieval schemes at St Mary the Virgin, Lakenheath, Suffolk; the Sir James Thornhill Baroque wall paintings at Hanbury Hall (NT) for which we won the 2010 Pilgrim Trust Award for Conservation; through to a 1950′s mural in a school in Wokingham. As conservators for the ‘Death Reawakened’ project, we were delighted to be part of the team to win the prestigious 2018 SPAB (Society for the Protection of Ancient Buildings) John Betjeman Award for our conservation of the internationally significant late 15th/ early 16th century wall paintings at the Grade 1-listed Guild Chapel in Stratford-upon-Avon. The award celebrates excellence in the repair of places of worship of all denominations in England and Wales. SPAB Judge Rachel Morley said of the conservation work: “We were impressed not only by the extent and depth of recording and analysis underpinning the careful conservation of these amazing paintings, but also by the great skill with which it had been undertaken. The work was delicate and sensitive and executed to a faultless standard”. The following is a list of conservation projects completed by the Perry Lithgow Partnership which are accessible by the public. The list is arranged alphabetically, county by county for ease of reference and contains a brief summary of each project. Bedford, St. Mary’s Church, Bedfordshire County Council. C14/15th wall painting on plaster, architectural scene within a niche in the east wall of south transept. Charlgrave, All Saint’s Church, Bedfordshire County Council. Extensive scheme of C14th wall paintings on plaster, depicting saints and apostles, in the south aisle and west wall of north aisle. Dunstable, 20 High Street, Bedfordshire County Council. Early C17th wall paintings on plaster of hunting scenes, transferred onto artificial support; further small panels on display in the public library. Ashampstead, St Clement’s Church. C13th wall paintings on plaster, depicting the Holy Infancy on the north wall of the nave and the Last Judgement on the chancel arch wall. Basildon Park, National Trust. The Angkor Wat Room wall painting, painted by Michael Dillon 1999. Acrylic on plaster. Brinkworth, St Michael & All Angels Church. C15th north aisle wall paintings. Lime painting on plaster. Compton Beauchamp, St Swithun’s Church. ca 1900 decorative wall painting on plaster in the chancel, painted by Lydia Lawrence. Littlecote House Hotel. C18th oil paint on the plaster ceiling of the Dutch Parlour. Ruscombe, St. James Church. C16th painted plaster tympanum, texts and Royal Arms. Early C20th oil painting on plaster depicting angels in a window splay. Wokingham, St Crispin’s School. Uncovering of the Summer & Autumn Murals by Fred Millet 1953. Two of a series of three paintings of the seasons on the school walls, commissioned as part of the original school design. Acrylic paint on plaster. Birmingham, St. Philip’s Cathedral. C18th painted wooden panel commemorating Sir Robert Walpole. Bournville School. C20th series of twelve frescoes in the assembly hall, painted in 1914 by Mary Sargant Florence and Mary Creighton MacDowall, depicting scenes from the New Testament. Amersham, Elmodesham Hall. C18th Staircase ceiling, oil paint on plaster, and painted panelling, oil on wood, depicting classical myths. All considered to be by Sir James Thornhill. Boveney, St Mary Magdalene Church. C14th wall painting of St Christopher. Broughton, St. Lawrence’s Church, Churches Conservation Trust. Extensive scheme of C14th, C15th, C16th & C17th wall paintings on plaster throughout the nave: Warning to Blasphemers, St. George, St Dunstan, dado pattern, Royal badges and texts. Chalfont St Giles, St Giles’ Church. C14th wall paintings on the south aisle, south wall. Cliveden House, The National Trust. C18th oil on canvas panel forming ceiling of garden pergola. Little Missenden, Church of St John the Baptist. Extensive scheme of late C12th-late C17th wall paintings throughout the building, including the Doom, St Christopher, 7 Deadly Sins, Annunciation to the Shepherds and numerous post Reformation cartouches. Stowe Landscape Gardens (NT), The Chinese House. Mid C18th timber framed pavilion designed by William Kent & painted by Francesco Sleter. Chinoiserie scheme (oil on gesso ground on timber). Thornton, St. Michael’s Church, Churches Conservation Trust. C18th Royal Arms painting on plaster, in the roof space on the chancel arch wall. Tyringham, St Peter’s Church. Extensive scheme of C19th wall and ceiling paintings in the chancel. Oil paint on plaster and stone. West Wycombe, West Wycombe Hall, National Trust. Conservation of the C18th painted ceilings in the Study, Red Drawing Room and Dining Room; conservation of C18th painted wall decoration in the Entrance Hall; conservation of C18th painted wall decoration in the Entrance Hall; conservation of the C18th South Colonnade external lower east wall painting; conservation of the C18th East Portico external ceiling and wall paintings; condition survey of the Staircase paintings; remedial treatments to painted ceilings in the Music Room and Blue Drawing Room. West Wycombe Village, National Trust. Late C17th? Fictive brickwork on external facade on No 21 the High Street. Oil and lime paint on brick, timber & plaster. Barton, St Peter’s Church. C13th scheme of wall paintings in the nave including, scenes from the life of Christ, the Weighing of Souls, St Martin, St Francis, St George. C17th texts with cartouche borders. Burwell, St Mary the Virgin Church. C15th St Christopher wall painting on plaster in the north aisle. Duxford, St. John’s Church. Churches Conservation Trust. C12th wall painting on plaster of Agnus Dei and saints on soffit of the east crossing arch and a latticework pattern on the west crossing arch. C13th & C14th wall painting on plaster in the chancel depicting scenes from the Birth of Christ and the Passion; also fictive curtaining. C15th wall paintings on plaster in the north aisle: St Leonard, St Ersamus, an unidentified figure and a Warning to Sabbath Breakers. Ickleton, St Mary’s Church. C12th wall painting on plaster, scenes from the Passion on the nave arcade wall and soffits. Kingston, St Andrew & All Saints Church. C14th wall paintings on plaster: Seven Corporal Acts of Mercy and the Seven Deadly Sins on the west wall of the north aisle; unidentified saint, St George and St Christopher on the north wall of the north aisle. Peterborough Cathedral. C13th Nave ceiling, oil paint on wood. 6 year phased programme of recording and treatment works to the timber structure and painted decoration. Extensive recording and treatment works to the C13th North and South Transept ceilings; the C14th Apse Ceiling (overpainted in C19th); the late C15th/early C16th Presbytery Ceiling (overpainted in C19th). All ceilings being oil paint on wood; Apse ceiling includes marouflage canvas. Extensive recording and treatment works to the C13th and C14th wall paintings throughout the building. Crewe, Crewe Hall Hotel. C19th wall paintings within the Chapel. Oil paint on plaster. Little Moreton Hall, The National Trust. C16th low relief painted plaster overmantel in the Withdrawing Room: Elizabeth I Royal Arms. A series of painted texts on the walls in the chapel. Calke Abbey, NationalTrust. C17th painted wood overmantel of family arms, Dining Room, Donor’s flat. Hardwick Hall, National Trust. Extensive C17th low relief painted plaster frieze around the walls of the High Great Chamber depicting the court of the Goddess Diana, hunting scenes, Venus and Ceres. C17th painted low relief overmantles in the Drawing Room and Dining Room. Taddington, St Michael’s Church. C18th wall painting on plaster: unidentified figure on the west wall. Greenway House, National Trust. Mid-C20th painted frieze in the library. Poster paint on plaster. Kingston Lacy (NT), Spanish Room. Re-used C17th Italian painted ceiling panels, inserted into the Spanish Room ceiling in mid C19th by Bankes. Conservation of 4 ceiling panels (oil & gilding on gesso). Wareham, St. Martin’s Church. Extensive scheme of wall paintings on plaster from C12th, C13th & C14th on the chancel arch and north arcade; C16th, C17th & C18th texts and memorial tablet. West Bromwich, Oak House, Metropolitan Borough of Sandwell. C16th decorative painted plaster panel, transferred onto artificial support. Barking, Eastbury House, National Trust. C18th wall paintings on plaster: scenes of ships & landscapes. Mundon on the Hill, St Mary’s Church, Friends of Friendless Churches. Conservation of the C18th wall paintings in the chancel, oil paint on plaster, and the fragmentary wall paintings of various dates (C14th-18th) on the nave north and south walls. Wickham Bishops, St Peter’s Church, Friends of Friendless Churches. C13th-C14th wall paintings throughout the chancel. Lime painting on plaster. Ebrington, St Eadburgha’s Church. C17th wall painting cartouches on the nave west wall. Lime painting on plaster. Hidcote Manor (NT). C20th painted decoration in the North and South Pavilions. Distemper, oil and alkyd paints on plaster. Oddington, Holy Ascension Church. Area of C19th painted decoration on the chancel arch wall and nave, north arcade wall. Oil paint on plaster. Oddington, St Nicholas’ Church. C14th Wall paintings of the Doom, Acts of Mercy & 7 Deadly Sins in the nave and Life of the Virgin in the south chapel. Oxenton, St. John the Baptist Church. C14th-17th superimposed fragments of wall paintings on plaster, including seraphim on wheels and Elizabethan Royal Arms . Tewkesbury Abbey. Muniments room: C14th wall painting on plaster, double line masonry pattern. Upper Apse, North Transept: C13th wall painting on plaster, decorative roundel with floral motif. Tewkesbury, 100 Church St. (The Hat Shop). C16th painted decoration on ceiling joists and wall paintings (dated c 1700) in the Marbled Room. Oil paint on wood; tempera paint on plaster. Tewkesbury, Glos, Royal Hop Pole Hotel. C16th and C17th painted decoration in the Banqueting Hall and Rooms 107 & 108. Tempera paint on wood and plaster. Alton, St Lawrence Church. C15th oil painting on stone on the north arcade pier, depicting St Cornelius, a king (Henry VI) and an unidentifed bishop. Headley, Suter’s Cottage, Hampshire County Council. Two C17th wall paintings on plaster of text and decorative motifs; transferred onto artificial supports. Pittleworth Manor. C16th wall paintings on plaster and wood depicting Dives & Lazarus. Ringwood, St. Peter & St. Paul Church. C19th oil on stone and plaster, wall paintings of the Evangelists on the east wall of the chancel. Romsey, King John’s House. C15th ? Incised graffiti & painted masonry pattern. Remedial treatment of plaster damage caused by structural movement. Southampton, Tudor House Museum. Southampton City Council. C16/17th plaster panel with incised drawing of a carrack: transferred onto an artificial support. Conservation of incised drawings of Tudor ships , graffiti & paintings on the walls of Rooms F01-03. Woodgreen, Woodgreen Village Hall. 1930’s mural scheme by R Baker & E Payne, depicting scenes of rural life in the village. Oil paint on plaster and canvas. Cwmmau Farmhouse (NT). Mid-C20th wall paintings in the Hall and Porch Room. Clodock, St Clodock’s Church. C14th wall painting on plaster of female saint in the window embrasure of the south wall, nave. Ledbury, Town Council Offices, Ledbury Town Council. C16th wall paintings on plaster and wood, extensive scheme of decorative painting with moralistic inscriptions. Madley, St Mary’s Church. C14th wall paintings on plaster, scenes from the Passion on chancel arch wall. Michaelchurch, St Michael the Archangel. Churches Conservation Trust. C13th wall paintings on plaster, extensive scheme of decorative motifs and masonry pattern in chancel. (This work is on-going). Ullingswick, St Luke’s Church. C16th oil painting on stone, painted memorial to the Hill family on the north wall of the nave. Wigmore, Chapel Farm. c.a. 1600 wall paintings on plaster and wood, extensive scheme of decoration. Berkhampstead, Ashridge Management College. C20th Dora Carrington murals, tempera on plaster. Chorleywood, Appletree Farmhouse. C.1600 painted decoration on timber and lime plaster. Harpenden, St George’s School. St George’s Chapel east wall painting. C20th oil paint on canvas (marouflage). Hoddesdon, The Star Inn. Six mid to late–C16th portrait panels. Wall paintings on lime plaster over wattle and daub. C16th painting on re-used timber joists. Knebworth House. C16th wall painting on plaster, arabesque decoration in Hampden Room. St. Albans Abbey & Cathedral. C12th North and South Ambulatory, painted plaster vault decoration; Choir arcade decoration on arch soffits and voussoir; Nave, north arcade, decoration on arch soffits and voussoir. C13th Nave, series of wall paintings: Crucifixions and scenes from the Life of the Virgin. C14th Feretory, oil painting on stone: St. William of York and an unidentified archbishop; North Ambulatory: painted plaster and stone vault decoration; Choir clerestory, four apostle figures. C15th painted plaster: North Transept, Doubting Thomas; North Ambulatory, King Offa. C17th North Ambulatory, Royal Arms, oil on wood. Also various marble, alabaster and stone memorial tablets. C17th Ramryge Chantry, oil paint on stone: heraldic decoration. North Transept east and north window arch decoration. C12th (restored C19th) wall painting on plaster: chevron pattern framed by architectural motifs. Entrance arch sofiits to north and south Choir ambulatory: wall paintings on plaster, painted architectural motifs. C17th Maynard Monument: wall painting on plaster and stone. C14th Lady Chapel, wall painting on limewash on stone and plaster, south window embrasure: background to carved female saints, painted with lettered scrolls and floral motifs. C12th decorative scheme on Organ Loft arcade soffits. Rainham Hall, National Trust. Extensive remedial works to the C18th staircase wall painting. Oil paint on plaster. Rochester Cathedral. C13th Wheel of Fortune, wall painting on stone in the Choir; extensive painted plaster vault decoration in the Crypt including the life of St Theophilus. C16th wall painting on stone, background to the tomb of William of Perth. Painted decoration on the Choir screen and two (detached) framed boards, with remains of C13th (glue size on gesso) and C14th (oil directly over earlier scheme) decoration. The boards were reframed and reglazed. Lubenham, All Saint’s Church. C14th/C17th decorative paintings on plaster, the chancel arch wall. Grantham, The King’s School. C16th wall painting on plaster and wood depicting architectural and animal motifs. Pinchbeck, St Mary’s Church. Cleaning and remedial treatment to extensive painted decoration on the C15th chancel and north chapel ceilings, C19th chancel and tower ceilings, C19th organ pipes and north aisle screen, the C17th Lambert-Carr Memorial, fragments of wall painting on the north walls of the north aisle and chapel. Various paints on wood, metal and plaster. Spalding, St Mary & St Nicolas’ Church. Cleaning and remedial treatment to the extensive C19th painted decoration on the chancel ceiling, rood cross and screen, chapel reredos and nave chandeliers. Oil paint on wood and metal. Stamford Museum, Lincolnshire County Council. C17th painted plaster and wood, half timbered wall moved from Lincoln and re-erected in the musuem. Blewcoat School, Caxton St. National Trust. C18th. Figurative wall painting of schoolboy within a niche on the south elevation. Oil paint on plaster. Chapel Royal. Early C18th royal heraldry wall painting on the north wall by Highmore. Dulwich, St Stephen’s Church. C19th fresco painting by Sir Edwin Poynter depicting the Vision of St Stephen and the Martyrdom of St Stephen. Ealing, St Peter’s Church. Early C20th marouflage painting depicting the ‘Annunciation to the Virgin Mary’, with attendant angels. Oil on canvas on plaster. Greenwich, St. Alfege’s Church. C19th wall paintings on plaster and wood in the apse. Victorian restoration of a decorative scheme by Sir James Thornhill. Hammersmith, London Greenside School. C20th wall painting by Gordon Cullen (1951). Oil paint on plaster. Hampton Court Palace, Fountain Court. Late-C17th roundels high on the exterior, north-facing wall depicting the 12 labours of Hercules. Oil paint on plaster. Kensington Palace. C18th schemes in the King’s State Apartments by William Kent. Painted door (King’s Staircase); painted ceiling coving (King’s Presence Chamber); Mars and Minerva ceiling canvas (King’s Privy Chamber). Oil paint on wood, plaster and canvas. Lambeth, 575 Wandsworth Rd. National Trust. Remedial conservation to various wall paintings throughout the house. Painted by the late owner Khadambi Asalache in mixed paint media on gypsum plaster during the period 1981-2006. Palace of Westminster, London. Mid-C19th frescos by Maclise and Horsey above the Stranger’s Gallery, House of Lords Chamber. Surface cleaning of the 8 mid-C19th Building of Britain wall paintings in St Stephen’s Hall (oil paint on canvas). Remedial conservation work to the C19th wall paintings in the Chapel of St Mary Undercroft Crypt Baptistry. Oil on plaster. C19th Vibration monitoring & conservation of the frescoes by Maclise of Trafalgar and Waterloo in the Royal Gallery (waterglass). Sutton House, National Trust. C20th ‘Squatter Art’ wall painting. Acrylic paint on paper. Hayes, Church of St Mary the Virgin. Late C15th. Wall painting on north wall, north aisle of St Christopher. Remedial treatment of flaking paint & salts damaged plaster. Whitchurch, St. Lawrence Church. C18th, painted panels on the north wall, remedial treatment. Barton Bendish, St. Mary’s Church, Churches Conservation Trust. C14th wall painting on plaster depicting the Martyrdom of St. Catherine(?) on the south wall of the nave. Burnham Overy, St. Clement’s Church. C15th wall painting on plaster of St. Christopher. Edingthorpe, All Saint’s Church. C14th wall paintings on plaster: St Christopher and the Corporal Works of Mercy. Gisleham, Holy Trinity Church. C15th wall paintings on plaster, saints in window splays of north wall. Hilgay, All Saint’s Church. C18th Manby Hatchment: oil on canvas and wood. Two Peal Boards, C19th & C20th, oil on wood. Little Witchingham, St. Faith’s Church, Churches Conservation Trust. C14th extensive scheme of wall paintings on plaster: Evangelist symbols; Morality Tales; Passion cycle; St. George. C17th texts. Moulton, St. Mary’s Church, Churches Conservation Trust. C14th wall paintings on plaster, St. Christopher on the north wall and the Corporal Works of Mercy on the south wall. C18th painted wooden Decalogue board with inset canvas panels painted in oil. Norfolk Museum of Rural Life, County Council. Two C17th painted plaster panels transferred onto artificial supports from houses in North and South Burlingham. Norwich, St. Gregory’s Church, Norwich Historic Churches Trust. C15th wall painting on plaster depicting St. George and the Dragon on the west wall of the north aisle and the Annunciation and Four Doctors of the Church in the south alsle. C15th oil painting on wood, bosses and corbels in the south aisle. C17th Royal Arms panel, oil paint on wood. Norwich, St. Martin’s at Palace Plain, Norwich Historic Churches Trust. C16th wall painting on plaster over east window; C19th painted plaster liturgical text, over south door. Oxborough, St John’s Church. C14th painted stone sedilia decoration. South Burlingham, Old Hall. C17th wall paintings on plaster in the Long Gallery, depicting various hunting scenes. Decorative scheme in adjoining Painted Chamber (Work on-going). Stow Bardolph Church. C18th 3 armorial hatchments in the Hare Chapel and 1 on the south wall: oil on canvas and wood. Thurgarton, All Saints Church, Churches Conservation Trust. C17th oil on canvas, Decalogue. Walsoken, All Saint’s Church. C16th wall painting on plaster, two C18th oil paintings on wood, two C19th oil paintings on canvas: the subject of each painting is the ‘Judgement of Solomon’. C15th & C17th ceiling ornament; oil paint on wood and lead: extensive series of large and smaller figures including Solomon, David and numerous angels. West Bilney, St. Cecilia’s Church, Norfolk Churches Trust. Three C19th oil paintings on wood: a Royal Arms, the Ten Commandments, the Lord’s Prayer and Creed. West Walton, St Mary the Virgin. C13th wall paintings on plaster, depicting fictive tapestries & masonry pattern in the clerestorey & series of roundels in nave spandrels. The latter are overpainted with C17th & C18th schemes of the Tribes of Israel, using oil paint. Astrop House, Northamptonshire. Water-damaged C18th ceiling paintings in the Drawing Room and Study. Oil paint on plaster. Canons Ashby Church, National Trust. C18th oil painting on plaster around the east window. Canons Ashby House. National Trust. C16th/C17th Winter Parlour, oil on wood panelled room decorated with heraldic devices; Drawing Room chimneypiece and overmantel, oil on wood, plaster and stone; Donor’s Flat, painted plaster ceiling and wall paintings of heraldry and domestic scenes; Tapestry Room, painted stone mullions; C18th oil on wood heraldic panels and dummy board. Croughton, All Saints Church. C14th scenes from the Passion, wall painting on plaster, the north aisle. Holcot, St Mary and All Saints’ Church. C14th wall paintings on plaster, west end of south aisle: Pentecost, St Michael weighing Souls, the Incredulity of St Thomas. Holdenby, All Saints Church, Churches Conservation Trust. C16th wall paintings on plaster, a large series of texts with ornamental borders throughout the church. Kettering, St Peter and St Paul’s Church. C13th wallpaintings on plaster in the nave: Censing Angels. Slapton, St Botolph’s Church. C14th & C15th wall paintings on plaster in the south aisle and soffits of arcade: Annunciation, Hanged Man, Three Living & Three Dead, Gossiping Women, Resurrection. Southwell, The Workhouse. National Trust. C19th wall painting on plaster in the Committee Room, fictive wood panelling with foliate frieze. C19th wall painting on plaster, fireplace surround in Master’s Bedroom. Wallington Hall National Trust. Extensive scheme of C19th oil painting on canvas, plaster and stone throughout the Central Hall. Abingdon, County Hall Museum. Late C17th. painted doors in the attic rooms. Oil paint on wood. Abingdon, Long Alley Almshouses. A scheme of early C17th external wall paintings on plaster. Beckley,St Mary’s Church. C17th Wall paintings on plaster including Prince of Wales Feathers, portcullis, scrolls and texts on the west wall of the nave. Black Bourton, St Mary’s Church. C13th wall paintings on plaster on the north wall of the nave: St Peter and St Paul, Baptism of Christ and the Stoning of St Stephen. Bledington, St Leonard’s Church. C13th painting on plaster on the chancel arch wall: the Virgin. C14th masonry pattern in the chancel. Cassington, St Peter’s Church. C13-16th wall paintings throughout the building. Chastleton House, National Trust. C17th painted plaster fireplaces and overmantles in the Sheldon Room, Great Chamber and Middle Chamber; low relief plaster masks in the Long Gallery; wall painting on plaster of a stag in the Great Hall. Churchill, Oxon, All Saints Church. C19th reredos. Oil paint on stone and plaster. Oil paint on plaster. Clifton Hampden Church. C15th? South aisle, painted text over arch. C18th Chancel, Decalogue panels: oil on zinc; nave, painted texts: oil on zinc. C19th Chancel, wall plate decoration: oil on wood. Combe, St Lawrence’s Church. Extensive scheme of C15th wall paintings on plaster: Last Judgement, Crucifixion, Annunciation, and St Christopher. C17th series of texts throughout the nave. Easington, St Peter’s Church. C16th wall painting on plaster, decoration based on a pineapple motif on the east wall of the chancel. Great Tew, St Michael & All Angels Church. ca1300 scenes from the Passion in the north aisle. Old Marston, St Nicholas’ Church. C18th wall painting on plaster on the chancel arch wall, a Royal Arms, Winner of an Oxford Preservation Trust Award 1989. Oxford, Balliol College MCR. 1930s scheme of wall paintings by Gilbert Spencer depicting the Foundation Legend of Balliol College. Oxford, Brasenose College. The Stocker Room. C17th overmantle wall painting. Oxford, Campion Hall, Lady Chapel. Mid C20th murals by Charles Mahoney. Oil on plaster. On-going. Oxford, Lincoln College. C17th wall paintings in 3 room in the college and C17th painted panelling in No. 118 High Street. Oil and tempera paint on plaster; oil paint on timber. Oxford, St Anthony’s College Chapel/Library. Late C19th & C20th wall paintings on plaster by C.E. Buckeridge and Ethel King Martin: fifteen scenes from the Life of the Virgin and Life of Christ. Shorthampton, All Saints Church. Extensive scheme of C13 to C18th wall paintings on plaster throughout the nave. South Newington, Church of St Peter ad Vincular. Remedial treatment to C14th & C15th wall paintings on plaster in the north aisle and nave. Swyncombe, St Botolph’s Church. C19th decorative wall paintings on plaster throughout the apse. Woodeaton, Holy Rood Church. C14th Chancel arch wall paintings on plaster – masonry pattern & Crucifixion. C17th ?painted text in South Porch. Lime painting on plaster. Attingham, National Trust. C18th painted decoration in the Boudoir. Oil on plaster and canvas. Richard’s Castle, St Bartholomew’s Church, Churches Conservation Trust. C17th wall paintings on plaster in the south aisle, texts and cartouche borders. Worthen, All Saint’s Church. C17th and C18th wall paintings on plaster. Fragmentary texts and figurative paintings throughout the nave. Wroxeter, St Andrew’s Church. C14th wall painting on plaster within the Easter Sepulchre. Shrewsbury, St Mary’s Church, Churches Conservation Trust. Chancel: C19th Painted stone sedilia. C18th George II Royal Arms on the west wall, gold leaf on gesso on wood. Tyntesfield, National Trust. C19th. stencil pattern decoration on the walls of the Stair Hall, Oak Room Lobby, Turret Room Corridor and Clyste Room Lobby. Alrewas, All Saints Church. 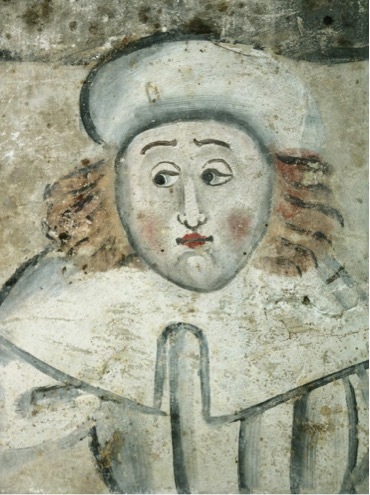 C14th wall painting on plaster, depicting unknown bishop(?) blessing a kneeling figure, with attendant herald. Shugborough Hall, National Trust. C18th oil painting on plaster, the Boudoir ceiling and cornice. Cotton, St Andrew’s Church. C14th. painted stone doorway in South Porch. Lime and oil paint on stone. Lakenheath, St Mary’s Church. Extensive scheme of C13th – C17th paintings in the nave. Mainly lime painting on plaster. Thornham Parva, St Mary’s Church. C14th wall paintings on plaster: Life of St Edmund on the north wall, scenes from the Infancy of Christ on the south wall, vine scroll pattern on the west wall. Ham House, National Trust. North front colonnade, east and west portico C18th wall paintings. Oil paint on plaster. Hascombe, St Peter’s Church. Extensive scheme of C19th decoration throughout the church, painting on plaster, stone, wood and metal. Winner of a 1992 Cookson Award for Conservation. Witley, All Saints Church. Extensive scheme of C12th wall paintings on plaster on the south and west walls. Chichester Cathedral. Extensive C15th and C16th painted decoration on the vaults and walls of the Lady Chapel. Oil and tempera paint on plaster and stone. Clayton, St John the Baptist’s Church. Extensive scheme of C12th wall paintings on plaster throughout nave. Trotton, St George’s Church. Extensive series of C14th & C15th wall paintings on plaster: north wall, memorial to the Camoys family; south wall, St Christopher, Camoys donor figures and heraldry. Baddesley Clinton (NT). Late C16th wall painting on the Upper Landing Gallery. Burton Dassett, All Saints Church. C14th–C18th, wall paintings on plaster figurative and decorative schemes throughout the nave, north and south transepts and south aisle. Wolston, St Margaret’s Church. C19th chancel ceiling painted decoration. Oil paint on paper, canvas and wood. Coventry, The Old Cathedral, The Phoenix Initiative. C14th painted fragment of stone from the Chapter House, showing a scene from the Apocalypse. The stone was retrieved during an archaeological dig. Dunchurch, Bilton Grange School. C19th oil paint on wood and plaster: painted overmantles and cornices in the Drawing Room/Library designed by A.W.N. Pugin. Commended in The Craftsmanship in Building Conservation Category – 1997 R.I.C.S. Awards. Haseley, St Mary’s Church. C17th wall paintings on plaster texts and cartouche border in the nave. Idlicote, St James’ Church. C17th wall painting on plaster, decalogue and cartouche border on south wall. Rowington, All Saints Church. C19th painted decoration on the North Aisle ceiling and the ceiling and tie-beam over the entrance to the north aisle. Oil paint on timber and plaster. Stratford-upon-Avon, The Guildhall. C15th Crucifixion painting & other painted decoration on the south & east walls. Oil on wood & plaster. C16th wall painting in the Council Chamber. Stratford-upon-Avon, The Guild Chapel. Late-C15th Last Judgement painting on the nave, east wall; late-C15th Allegory on Morality painting on the nave, west wall; late-C15th sections of the Dance of Death and Life of Adam wall paintings on the nave, north and south walls. Oil paint on dressed stone and plaster. Winner of the 2018 SPAB Betjeman Award for Conservation. Weston-on-Avon, Church of All Saints. Remedial conservation to the C15th wall painting on the nave north wall and late C17th? cartouche wall painting on the nave upper south wall. Lime painting on plaster. Wyken, St Mary Magdalen’s Church. C15th tempera painting on plaster, north wall: St Christopher. Baginton, St John the Baptist’s Church. C14th wall painting on plaster, chancel arch wall: St Peter. Belbroughton, Holy Trinity Church. C14th unidentified figure, wall painting on plaster, south aisle; C18th George III Royal Arms, oil on panel, and Noel family hatchment, oil on panel. Birmingham, St Chad’s Cathedral. C19th oil paint on plaster. Extensive Pugin decorative schemes in the Hardman and St Peter Chapels. Dudley, Town Hall. C20th wall painting on plaster by Hans Feibusch. Knowle, Parish Church. Early C20th painted decoration throughout the Soldier’s Chapel. Oil paint on plaster and wood. Middleton, Church of St John the Baptist. C14th north aisle: wall paintings on plaster on the east, west and south walls, depicting respectively Christ in Majesty; Last Judgement and vine scroll pattern. (Work on-going). C15th? Chancel arch, nave: wall painting on plaster: Doom? Moseley Old Hall, The National Trust. C16th decorative wall painting on plaster in the Chapel. Walsall, Church of St Mary’s the Mount. C19th 4 oil on canvas paintings of evangelists; east wall: oil on plaster relief depicting the Trinity, Crucifixion and evangelist symbols; gallery frontage: oil on canvas and leatherette, depicting angels holding churches and the Virgin. Inglesham, Wiltshire, St John the Baptist. C14th- C18th north aisle, south aisle and porch wall paintings. Lacock Abbey, National Trust. C15th St Augustine painting in the North Cloister. Oil paint on plaster. Lacock, St Cyriac’s Church. Extensive painted decoration on the C15th Lady Chapel vaulting and the C16th Sherrington tomb. Oil paint on stone. Oaksey, All Saints Church. Extensive wall paintings on plaster throughout: C13th masonry pattern; C14th St Christopher; C15th Sunday Christ and Christ of the Trades; C17th text over west door and texts in nave. Eldersfield, St John the Baptist. C18th oil on canvas, Decalogue. Hanbury Hall, National Trust. C18th oil on plaster. Remedial treatment to extensive Staircase and Entrance Hall schemes by Sir James Thornhill. Winner of the 2010 Pilgrim Trust ward for Conservation. Harvington Hall. Extensive series of C16th wall paintings on plaster and wood throughout the building: the Nine Worthies Passage, the Great Staircase, the Spiral Staircase, the Mermaid Passage, the Chapel; remedial treatment to other painted schemes. Heightington, St Giles’ Church. Early C13th wall paintings in the nave and chancel. Himbleton, St Mary Magdalene Church. C16th wall painting on plaster: Elizabeth I Royal Arms on the east wall of the chancel. Kyre, St Mary’s Church. C14th wall painting on plaster, female saint on window splay in side chapel. Little Malvern, St Wulstan’s Church. Late C19th wall paintings on plaster in the Baptistry. Decorative scheme incl. a Baptism of Christ. Lower Sapey, St Bartholomew’s Church, Churches Conservation Trust. Fragmentary traces of C12th, C13th, C14th &C17th wall paintings on plaster including: masonry pattern, Royal Arms and texts. Ludlow, 53 Broad St. C16th/17th painting on plaster: Royal Arms, transferred to an artificial support. Madresfield Court, Chapel. C19th oil on plaster: a series of figurative scenes. Martley, St Peter’s Church. C14th. Nave, north wall: wall painting on plaster depicting possible scenes from life of Christ. Pendock, Old Church. Churches Conservation Trust. C14th? wall paintings on plaster, unidnetified scheme. Emergency consolidation and survey of decoration surviving beneath covering limewash. Pershore, St Andrew’s Parish Centre. Late C14/early C15th decorative wall paintings in the chancel. Pinvin, St Nicholas’ Church. C14th wall painting on plaster, south wall of the nave: Life of Christ. Worcester, 14 Friar Street. C17th floral scrollwork wall painting on plaster. Worcester, The Commandery. Extensive scheme of wall paintings on plaster, dated ca. 1500, in the Dying Room. The paintings depict martyrdom scenes, saints and the Trinity. Worcester, 32 Friar Street. C16th ceiling painting on plaster. Easby, St Agatha’s Church. C13th extensive scheme of wall paintings on plaster in the Chancel. C18th west wall of south aisle: wall painting on plaster – cartouche. Langstrothdale, Cowside Farm. The Landmark Trust. C17th wall paintings on plaster: inscriptions and cartouche borders in the Parlour. Shandy Hall, Coxwold. C16th Paint & plaster consolidation to wll paintings in the Parlour & Bedroom. Glue size painting on wattle & daub panels. South Cowton, St Mary’s Church. Churches Conservation Trust. C15th? Series of 10 consecration crosses throughout the nave & Chancel, wall paintings on plaster, heavily restored in the mid C20th. Llanelli, Llanelly House. Mid-C18th figurative and floral motif paintings on panelling in the Best Room Closet. Oil paint on wood. Patricio, Merthyr Issui church. C17th paintings on plaster on the north wall: Royal Arms and texts. Llandeloy, St Eloi’s Church. Friends of Friendless Churches Trust. C.1927 The Coates Carter Reredos. Oil paint on gesso. St Apolline’s Chapel. C13th wall paintings on plaster, north wall: Last Supper, Betrayal, floral motif. Ste Marie du Castel. C13th wall paintings on plaster: Three Living and Three Dead, an unidentified Martyr and the Last Supper. Jerpoint Abbey, The Office of Public Works. C16th? heraldic wall paintings in the chancel. Kells Priory, The Office of Public Works. C13th masonry pattern wall paintings in the reveals of blocked-in windows on the north wall of the chancel. Cashel, Cormac’s Chapel, The Office of Public Works. C12th scheme of wall paintings on plaster and painted stone in the chancel and on the chancel arch: decorative and figurative scenes. C15th scheme of wall paintings in the South Transept of the Cathedral. Clonmel, The Main Guard, The Office of Public Works. Fragments of painted plaster decoration dating from C17th onwards, including heraldic scheme on the south wall. Abbeyknockmoy (The Office of Public Works). C15th wall painting of the Three Living and Three Dead; Martyrdom of St Sebastian on the chancel, north wall.